In addition to around 600 residents, there are more than 200 migrants found in Costa Rica. So the best time for birding in Costa Rica is when the migrants are there, August to March, and the most spectacular long distance migrants to Costa Rica come from temperature and boreal North America. Among migratory land birds, warblers predominate in numbers of species and probably also in number of individuals, but flycatchers, swallows, thrushes, vireos, orioles, tanagers and finches, with a few pigeons, cuckoos and kingfishers and a number of raptors swell the multitude. Appearing first along the Caribbean coast in August, migrants arrive in larger numbers in September and October. Some continue onward to winter in South America, but countless more remain in Costa Rica, spreading over the whole country, in both humid and semiarid regions and extending into the mountaintops. It is because of this that Costa Rica is one of the world's premier bird watching destination and one of the most bio-diverse locations in the world, over 870 bird species have now been recorded there. Costa Rica acts as a continuous corridor for migration between from North and South America and is a meeting ground for seemingly unimaginable bio diversity. Costa Rica’s geography is dominated by two coasts and by mountains that cover more than half the land, greatly influencing the climate. Variations in temperature and rainfall and a wide range of elevations combine to produce the rich and varied vegetation that support the countryÂ’s wealth of birds. Due to Costa RicaÂ’s small size, range of elevation and twelve distinct ecological zones our tours encompass a wide variety of habitats and astonishingly abundant wildlife diversity, while maintaining a comfortable pace. But its NOT just all about birds! There are over 200 mammals to look for, 3000 Butterflies and Moths, 180 Amphibians of which 135 are frogs! There are 226 Reptiles to be found, including some very large crocodiles!! Costa Rica is home to a vast array of plants and trees including over 1,600 epiphytic plants, many of which are orchids. After an early breakfast and garden walk at the Hotel we depart for the mountains. We will head east from San Jose on the Guapiles Highway, the Zurqua tunnel transports you from the modern world into the rainforest and cloud forest of Braulio Carrillo National Park, as we drive the views are breathtaking. The park is 117,300 acres (47,500 hectares, 183 square miles, 140 times the size of central park NYC,) and ranges from 118 feet (36 meters) to 9,500 feet (2900 meters). Because of the park's large size and its varied climate it is home to several distinct life zones. Ranging from high-altitude cloud forest to tropical lowlands rainforest, it boasts one of the highest levels of biodiversity in Costa Rica. More than 90% of the park is covered in primary forest, providing a unique snapshot of ancient ecological conditions. More than 500 species of birds have been recorded: including Resplendent Quetzals, Bare-necked Umbrella Bird, Snowcap, Brown-billed Scythebill, Black-crowned Antpitta, Golden-browed Chlorophonia, Flame-throated Warblers, Long-tailed Silky-flycatchers, Yellow-eared Toucanet, and Latticed-tailed Trogon. After birding the morning we will have lunch in a Restaurant nearby and continue birding in the Sarapiqui area.We will then drive to La Selva near Puerto Viejo de Sarapiqui, if we have time we will stop and view open fields where a good variety of new species can be found, including the Nicaraguan Seed-Finch. Mammals on show may include: Two and three-toed Sloth, Mantled Howler Monkey, White-Throated Capuchin, Agouti, White-nosed Coati, Collared Peccary, Tyra, and Neotropical River Otter. We will spend 2 nights at La Selva biological station lodge. An evening walk along the trails can be very exciting with many small mammals, Common Pauroque, frogs, toads and insects on show. Night at La Selva. Day 3 - Full day birding La Selva Biological Station. Today will start with a great breakfast at 6:00 a.m. And then we will start a full day at this excellent birding destination. Dr. Leslie Holdridge could be considered the father of rain forest science in Costa Rica. He established La Selva as a study site on mixed plantations for the improvement of natural resources management in 1954. Since its purchase in 1968 by the Organization for Tropical Studies (OTS) itÂ’s been declared a private Biological Reserve and grown into one of the premier sites in the world for research on tropical rain forest. La Selva is covered with what is technically known as tropical pre-montane wet forest and more commonly referred to as rainforest. There is no better place in Costa Rica to learn about this ever more endangered ecosystem. 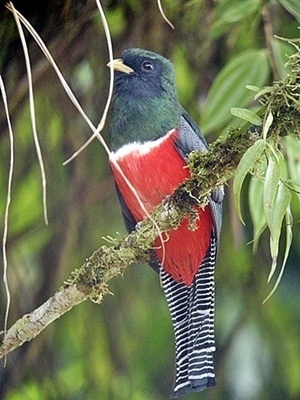 La Selva is a fabulous birding destination with over 400 species recorded in the area. Terrific birding opportunities are available in the more open areas both outside and inside the entrance gate. It's perhaps the best place in Costa Rica to see Tinamou, which are normally very secretive but here they have become accustomed to the presence of humans. The highly endangered Great Green Macaw regularly puts in an appearance at La Selva, This is also a great place to see many species of hummingbirds and tanagers, including the beautiful Passerini's Tanager; other specialties include; Snowy Cotinga, Long-tailed Tyrant, Semiplumbeous Hawk, Broad-billed Motmot, Rufous Motmot, just to mention a few. Night at Selva Verde Lodge. Day 4 - Transfer to Arenal Observatory Lodge. After another superb Costa Rican breakfast we will spend all morning travelling to Arenal Volcano. Climbing up through The Cordillera Central we pass through some stunning countryside and will see the volcano's Turrialba and Poás from the bus. We stop at two excellent places where hummingbirds are prevalent including the regional endemic, Coppery-headed Hummingbird. It is also our best chance to see the Emerald Toucanet. Arenal Observatory Lodge is safely located 2.7 kilometers (1.7 miles) from the south side of Arenal Volcano, but the live volcano seems so close that you could reach out and touch it. The perfectly-shaped volcanic cone commands nearly every view at the hotel – from the panoramic windows of the Arenal Observatory restaurant to the main buildings and most of the guest rooms. Beautiful Lake Arenal with its many little islands stretches west into the sunset. Resting on a ridge amid tall pine trees and luxuriant rainforest, Arenal Observatory Lodge is the only hotel that is located inside the Arenal Volcano National Park. Eleven kilometers (7 miles) of well-maintained hiking, horseback riding and mountain biking trails wind through the Arenal Volcano hotel’s 870-acre (352-hectare) property, through primary and secondary rainforest, past waterfalls and across verdant pastures. Plenty of wildlife lives in the area, including three kinds of monkeys, anteaters, coatis, raccoons, deer, and more than 400 species of birds – making Arenal Observatory Lodge a preferred destination for bird watching in Costa Rica. We will spend the afternoon birding around the central lodge and various trails, followed by a delicious evening meal in the large restaurant of the lodge. The well developed trail system access a good variety of habitats including pasture and secondary & primary rainforest. One particular trail leads to a scenic waterfall. Common species seen around the lodge include: Hoffmann’s Woodpecker, Montezuma Oropendola and Scarlet-rumped Cacique, whilst, Grey-headed Chachalaca, White-lined Tanager, Green & Red-legged Honeycreepers and Black-cheeked Woodpecker frequent the fruit trees. Typical hummingbird species that visit the feeders are; White-necked Jacobin, Green Breasted Mango, Violet-crowned Woodnymph, Brown Violetear and Green-crowned Brilliant. After dinner we can go for a walk along nearby trails and listen for Common Pauraque and Mottled Owl and we may be lucky enough to hear a Crested Owl or even a Great Potoo! Night at Arenal Observatory. The number of options for walks seems endless and so does the number of bird species. We will take an easy half-day walk to the waterfall looking Antbirds, Jacamars, Trogons, Toucans, Aracari and Emerald Tanagers and we may see Black and Yellow Tanager, Summer Tanager, White Shouldered Tanager and Speckled Tanager. A few special birds may be seen including Bare-necked Umbrellabird, Lovely Cotinga, Black-crested Coquette and Song Wren. Birds of prey are fairly abundant in the park, we may see the beautiful Semiplumbeous Hawk, the majestic Ornate Hawk-Eagle and several common hawks and kites. We will walk along the approach track that takes us through small farm holdings where White-throated Magpie-Jays are frequent visitors and wooded areas with streams and rivers where we should find Green Kingfisher, Amazon Kingfisher, Buff-rumped Warbler, Black Phoebe and several flycatchers. All-in-all is a great place to visit and where we may list over 150 species during our stay!! Night at Arenal Observatory. Day 7 - Morning transfer to Tapanti National Park. After an early breakfast we will hit the road passing through scenic landscape and the out skirts of San Jose (the capital) to reach our next birding destination, Tapanti National Park. The Tapanti National Park protects mountainous forested areas in the northern Talamanca Mountain region, north of Chirripo National Park and sits in upper-middle- elevation forest at a height of 1,250 meters. The park is traversed by the Rio Grande de Orosi, with many other rivers and creeks joining the main river. The Tapanti region is one of the rainiest in the country but the area is a birding gem providing access to a wide variety of species in beautiful forest and you should see many new species there. We arrive at our superb spa-lodge during the early afternoon with plenty of time to explore the immediate area around the grounds. Many species can be found in the cow pastures and coffee fields just before the park entrance, there are also feeders all around the restaurant and nearby there is a Trout Farm with several ponds and feeder streams. Species we may encounter are Olive-crowned Yellowthroat, Chestnut-headed Oropenola, White-naped Bush-Finch and Mourning Warbler. Porter weed bushes around the lodge often attract Green Thorntail and other interesting hummingbirds. Night at Ria Perlas Lodge. At Tapanti the birding is easy going and exciting. The amazing number of epiphytic growth (including many orchids), the general appearance of the forest, the scented air, and certain species such as Chestnut-headed Oropendola, Collared Trogon, Streaked Xenops, a few foliage-gleaners, and other birds being easier to find here than other sites in Costa Rica, make Tapanti a great birding locality. An early walk around the Lodge will produce a superb list of species and we may hear the call of the Black-breasted Wood-Quail from the nearby forest. The feeders will be very active at this time with tanagers, hummers, finches and warblers all on show. Our day in the Tapanti forest will include walks along the main central track and a couple of excursions onto forest tracks. The Sendero Oropendola is my favourite and forms a roughly shaped figure of 8 with part of it passing close to the river. Along this trail we may see the regional endemics; Prong-billed Barbet and the Black-bellied Hummingbird, also Golden-bellied Flycatcher, White-throated Spadebill, Slaty-capped Flycatcher, Scaled Antpitta and Black-faced Solitaire. The array of Tanagers on show is amazing, we should see mixed feeding flocks consisting of; Common Bush Tanagers, Passerini's, Silver-throated, Speckled, Bay-headed, Palm, Blue-gray, White-winged and Summer Tanagers. Lunch will be taken back at the lodge and during the afternoon you have the choice of relaxing around the lodge or making a second excursion into the park. Overnight at Ria Perlas Lodge. Leaving Tapanti after our early breakfast we travel a short distance to the Savegre Valley but before we arrive we will stop at a well known site where we can look for the Resplendent Quetzal. The Resplendent Quetzal (Pharomachrus mocinno) is the bird the Aztecs adored, and it is considered one of the most beautiful birds in the tropics. It is found here, at Mirador de Quetzales. Surrounded by Tropical Cloud Forest and clear water creeks flowing down the mountains this superb habitat is excellent for many other species which includes; the Wren-thrush (formerly named Zeledonia), Long-tailed Silky Flycatcher, Golden-browed Chlorophonia, Black-billed Nightingale Thrush, Black-capped Flycatcher and Slaty Flowerpiercer. 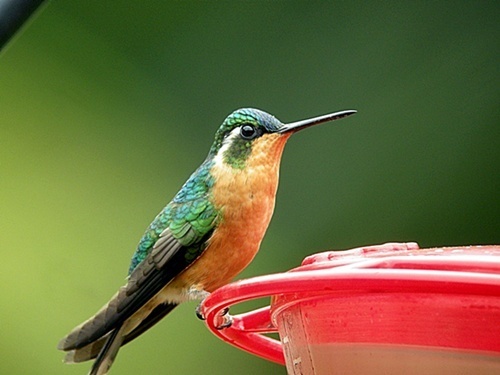 At the hummer feeders we will look for, Violet-eared, Volcano, Magnificent and the Fiery-throated Hummingbirds. After lunch, taken at the Mirador, we set off for the Savegre Valley. This is one of my favourite places in Costa Rica; this highland location has such a lot to offer the visiting birder. Hotel Savegre (2,200 Meters) is a private nature reserve of almost 400 hectares (988 acres) accessed through a network of trails of around 30 km. (18.6 miles) that start and end at the hotel. The reserve has a spectacular high level of biodiversity that attracts visitors from all over the world. It is also a scientific field research site, but it is also a place of great peace and tranquility. Part of the reserve is secondary forest growth, once felled for cattle grazing it was returned to its natural state a number of years ago forming a unique habitat in this area. Four of the six trails are interconnected we will explore the reserve by walking some of the trails, a great advantage here is that we can be driven high up into the reserve and then spent a few hours walking back down to the hotel complex. We will arrive early evening so our birding will be restricted to the immediate area around the hotel; there are plenty of feeders around the restaurant area. Night at Savegre Hotel. Day 10 - all day Savegre Valley. 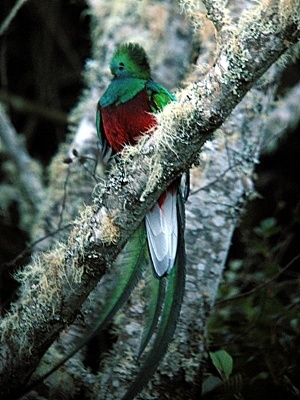 An early morning (optional) excursion at 5:30am will be made to see the Quetzal if we havenÂ’t seen it already and for those who would like to get better photographs of this exquisite bird. During breakfast we can watch a set of feeders that are positioned right outside the restaurant area and they attract many hummingbirds such as: Grey-tailed Mountain Gem, Purple-throated Mountain Gem, Whiter-bellied Mountain Gem and Striped-tailed Hummingbird. 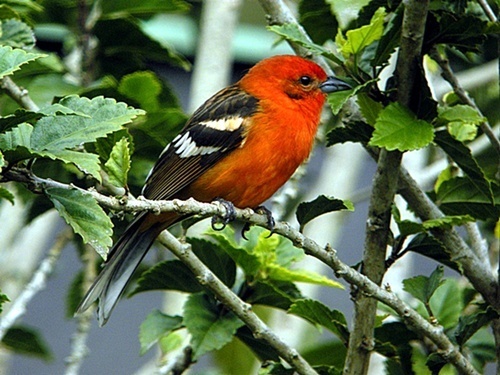 The bird tables may attract both the Red-crowned and the Acorn Woodpeckers, also the stunning Flame-coloured Tanager. After breakfast we will be driven high into the mountains to begin our birding in earnest, during our leisurely descent we can look for Yellow-thighed Finch, Flame-throated Warbler, Yellow-winged Vireo, Mountain Robin, Rufous-browed Peppershrike, and the stunning little gem; the Elegant Euphonia. The beautiful Collared Redstart is quite common in this region and quickly became a favourite of mine. Further down the track we can look for Brown-capped Vireo, Townsend's Warbler, Wilson's Warbler, Black-cheeked Warbler, Tufted Flycatcher and Buff-fronted Quail Dove. We should arrive back at the hotel just in time for lunch and during lunch we can watch the bird tables from the terrace. The afternoon will be a repeat of the morning scenario, we shall be taken up the mountainside by truck and then we walked back down using a different trail. Other species to look for are; Flame-coloured Tanager, Slaty Flowerpiercer, Tennessee Warbler, Red-crowned Woodpecker, Hairy Woodpecker and Yellow-bellied Sapsucker. Small flocks of Pale-vented Pigeons can be seen and perhaps Red-tailed Hawks overhead. Night at Savegre Hotel. We are now heading out of the mountains into the south pacific middle-elevations. Talari Lodge is found at only 800 meters elevation and is a small 10 hectare property and is extremely popular with visiting birders. 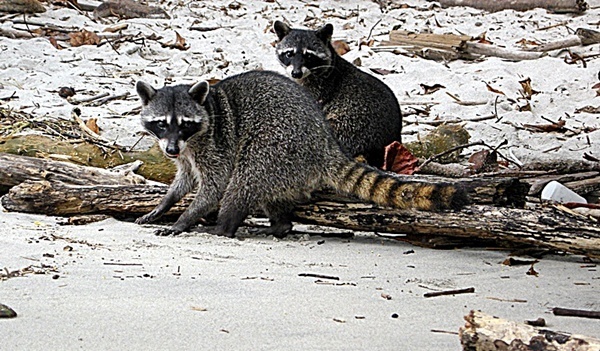 Most of the habitat is gardens and young second-growth forest, however, the area was planted with a wide variety of fruiting trees and this attracts a wealth of wildlife. 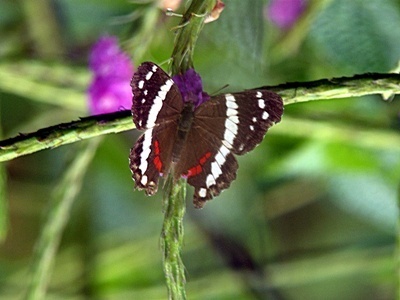 We may see some regional endemic species such as: Garden Emerald, Snowy-bellied Hummingbird and White-crested Coquette, as well as Pearl Kite, Scaled Pigeon, tropical Screech Owl and Scrub Greenlet. This is another one of my favourite birding destinations in Costa Rica, It boasts a great number of species, including a bunch of colorful and stunning Tanagers, The Alexander Skutch "Los Cusingos" Bird Sanctuary is located in the community of QuizarrÃ¡, near to San Isidro and is a five minute drive from Talari Lodge. 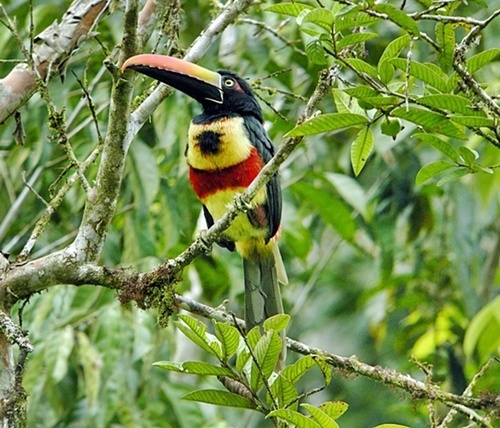 This 78-hectare farm was purchased in 1941 by botanist and ornithologist Alexander F. Skutch, who named it "Los Cusingos" after the endemic Fiery-billed Aracari (Pteroglossus frantzii). Skutch wrote over 40 books and over 200 papers on ornithology, he died eight days before his 100th birthday, in May, 2004. His house remains just as he left it and it is now a Museum dedicated to his life, it is a wonderful place to visit. According to the Leslie R. Holdridge Life Zone System the forest here is classified as very moist pre-montane. However it is also noted that according to the Luis Diego Gomez classification system it is seasonal evergreen forest, the last of such remaining in Costa Rica. Some of the birds found here are White-crested Coquette, Long-billed Starthroat, Silver-throated Tanager, Red-legged Honeycreeper, Shining Honeycreeper, and the endemics Orange-collared Manakin, Turquoise Cotinga, Fiery-billed Aracari also Red-headed Barbet and Yellow-bellied Tyrannulet. We will spend the afternoon at Los Cusingos before spending the night at Talari Lodge. After an early morning walk around the gardens of Talari Lodge and after a delicious breakfast we set off for Carara National Park which is found in the South pacific lowlands at sea level. We will make several stops along the way including the rice fields near Quepos, the bay at Quepos and the river Parrita River. Our first coastal birds will be added to our list together with several wader species, which may include Magnificent Frigatebird, Brown Booby, Royal and Caspian Terns, Great Egret, Little Blue Heron, Green Heron and Bare-throated Heron to name but a few. The shrimp farm near Parrita may hold ducks and grebes as well as a wealth of herons, egrets, waders and birds of prey. We arrive at Cerro Lodge during the late afternoon, hopefully with a little time to bird-watch in the valley. Cerro Lodge is an environmentally friendly project located on a farm and is just 10 minutes from Carara National Park. The lodge is in the middle of one of the most important refuges for the Scarlet Macaw; these spectacular red, blue, and yellow parrots are often seen as they fly through the valley at Cerro Lodge. Our accommodation at the lodge is a series of comfortable, modern bungalows with private bathroom and indoor garden, swimming pool and a dining area. All this is surrounded by trees, palms, gardens, and panoramic views of the Pacific Ocean, mangrove forests, and Carara National Park, over 150 species of birds have been recorded in this small area alone! Night at Cerro Lodge. At last we reach CARARA, one of Costa Rica’s most famous birding destinations! It is the northern most birding site of the South Pacific Slope region, sitting on the southern bank of the River Tarcoles. Since Carara lies on the border (created by the river) between tropical dry forest and tropical wet forest it offer a unique and extremely diverse ecosystem, species from both regions live side by side. Long-tailed Manakin, Rufous-and-white Wren and Orange-fronted Parakeet are just a few examples of dry forest species from the North Pacific region that can be found side by side with Baird’s Trogon, Black-bellied Wren and Fiery-billed Aracari of the South Pacific region. The park covers some 4600 hectares and offers two very well maintained trails both of which we will trek. The Â‘Headquarter TrailsÂ’incorporate three looped trails all of which lead into old-growth forest, it is dark inside the forest but it is an excellent look for Great Tinamou, Sulphur-rumped Flycatcher, Blue-crowned Manakin and White-throated Shrike-Tanager, it is also one of the best places in Costa Rica to find the Streak-Breasted Antpitta which I was lucky enough to see in 2011 & 2018. The Â‘River TrailÂ’ takes you through patches of forest and clearings and just after it crosses a stream we can look for the Royal Flycatcher, one of the most wanted species by visiting birders. This forest habitat is a great place to find mixed-flock species which can be extremely diverse. 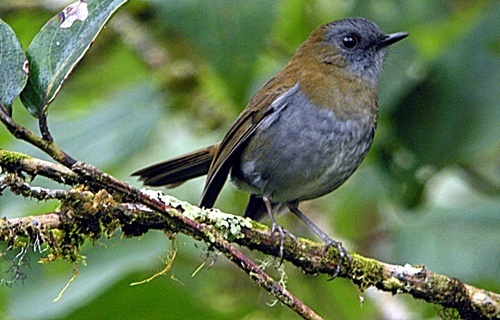 Whilst Black-hooded Antshrike, Dot-winged Antwren, Log-billed Gnatwren and Barred Antshrike (another favourite of mine) are regularly seen other interesting species can be found such as Northern Bentbill, Slate-headed Tody-flycatcher and White-whiskered Puffbird. At one point the trail runs alongside a section of the Tarcoles River, a meander that has been cut off from the river, called the Â‘MeÃ¡ndrica LagoonÂ’. Here you can see Caiman floating in the water; also many water birds inhabit this area. We can look for Purple Gallinule, Northern Jacana, American Pygmy Kingfisher and Mangrove Swallow, the main attraction at the lagoon is the roosting Boat-billed Herons a quick search of the overhanging trees may reveal several of these unusual looking birds. Lunch will be taken at a roadside restaurant found north of the river Tarcoles this will give us the opportunity to walk across the famous bridge and look down upon some of the biggest Crocodiles you are ever likely to see! Night at Cerro Lodge. Our journey continues northward along the Pacific coast today as we head for La Ensenada Wildlife Refuge which is found on the mainland coast of the Gulf of Nicoya. But before we set off north we have an exciting boat trip booked on the river Tarcoles. The Tarcoles river mouth offer some excellent coastal birding, you can find a vast range of shorebirds, terns, gulls as well as all of the mangrove specialties. We pick up our boat at the jetty near the river mouth and proceed into the mangrove habitat where we may see Boat-billed Heron, Rufous-browed Peppershrike, Mangrove Vireo, Panama Flycatcher, Mangrove Hummingbird and Cinnamon Becard. Common Black-Hawks circle above you whilst in the mangrove creeks you may catch a glimpse of a Rufous-necked Woodrail. During the afternoon we arrive at La Ensenada which is a working cattle ranch, a superb hotel with delicious food, and, paradoxically, a wildlife refuge. It offers a comfortable and relaxing setting for bird-watching the north Pacific slopes. The birding in the area is very rewarding and it is very easy is build a sizeable list. A good percentage of the habitat is, of course, cow pasture with some patchy forest, this often produces most of the dry-forest species. It is a reliable place to find Spot-breasted Oriole and the Three-wattled Bellbird is easily found during January/February. After dark we can listen for Common Pauraque, Ferruginous Pygmy-Owl and Pacific Screech Owl. Night at Ensenada Lodge. Our last full day in the field!! An optional early excursion around the hotel grounds is available; we can look for White-throated Magpie-Jay, Crested bobwhite and Cinnamon Hummingbird. In the dense scrub we may catch a glimpse of Banded Wren and Brown-crested Flycatcher. In the fields we can search for Lesser ground-Cuckoo and the refuge maintains several trails that meander through the expansive grounds. Along these trails we can look for: Eastern Meadowlark, Orange-chinned Parakeet as well as Orange-fronted Parakeet which usually perches high up in the trees. In the trees and shrubs we are likely to encounter the likes of; Black-striped Sparrow, Scrub Euphonia, Rose-throated Becard and White-lored Gnatcatcher. There is also a series of salinas (salt pans) on the property where sea salt is harvested; the salinas offers some excellent birding especially for waders such as Black-necked Stilt, Least Sandpiper, Marbled Godwit and WilsonÂ’s Plover. There are also Wood Stork, Roseate Spoonbill and Yellow-crowned night-Heron to look for. An area of nice mangroves can found near the salinas, this habitat supports; Yellow (Mangrove) Warbler, Mangrove Hummingbird, Northern-scrub Flycatcher and Mangrove Vireo. Buffet lunch will be taken in the lodge and the afternoon will spent back on the trails. Night at Ensenada Lodge. There will be very little time for birding this morning as we have to be back at San Jose by 11am for our departure flight. An early morning stroll around the gardens is optional. 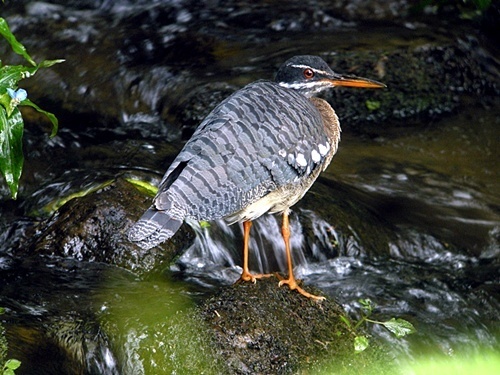 An exciting and educational 16-day birdwatching tour of Cosat Rica. Day-light hours are between 5:30am and 7pm and are tropical in temperature and humidity. However please note the following: Costa Rica has two distinct seasons Â‘DryÂ’ and Â‘wetÂ’. We are travelling in the middle of the dry season, but donÂ’t be fooled by the name. As Â‘DryÂ’ season simply means Â‘less wetÂ’ in some parts of the country. Our first few days on the Caribbean Slopes will be warm and quite humid and then as we climb into the mountains it will be cold in the mornings and it will probably rain some of the time. It will then get humid again as we drop back down to the south Pacific region and get warmer,even hot during the last 3-4 days in the north Pacific zone. A typical day will begin with an early breakfast, followed by a morning excursion, then lunch, with a short rest after lunch especially in the hot/humid regions. Typical of tropical regions there will be a mid-afternoon lull in bird activity. Dinner will be between 7:00 and 8pm. There will be at least two evening guided walks in the forest. We are not a company that dashes around to collect as many ticks as possible, we do not compete with anyone, we would like to show you as many species as we can at our own pace. Expect to see around 400 - 450 species during the holiday. All breakfasts and dinners are included in the price, lunches are not. Some lunches will be picnics which will be ordered from the hotel, others will be taken at various lodges, camps and restaurants, allow 5-15 dollars for lunch per day. Costa Rican food is delicious, especially the breakfast which includes: pancakes, plantain, papaya, pineapple,bread, local jams, yoghurt etc. Dinner recipes are mainly based around rice & beans, but don't be shocked when rice and beans turns up on your breakfast plate too! Vegetarians are easily catered for. Walking is easy, mostly we take short walks up to about 3 kilometers over easy terrain, Costa Rica has plenty of hills but we avoid any strenuous walking. The air can a be a little thin especially in the highlands when we stop at Savegre Hotel and visit the Mirador Quetzales!. Comfy high-sided, waterproof, walking shoes with sturdy corrugated soles for grip are best. All boat trips and ferry crossings are included in the price. There are no compulsory health requirements for entering Costa Rica but you must consult your GP in this respect. Insects are not a major problem but you must take precautions to avoid health risks, a good quality repellent is recommended. WINGSPAN BIRD TOURS offer a variety of exciting bird-watching holidays ranging from day trips in Spain (Andalucia) to 15 - days in The Gambia. We also offer bird tours of Bulgaria, Hungary, Morocco, Costa Rica, Lesvos-(Greece), Australia (from 2016), Oman and several other areas of Spain.